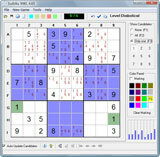 Sudoku 9981 - Sudoku puzzle game for Windows,with the color marking function and specific method to control candidate number,you can use the advanced techniques of sudoku more easily.We recommend you try the Sudoku game. 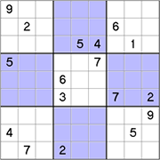 The Samurai Sudoku puzzles is another variation of the original Sudoku Puzzles. It has a unique solution that can be reached logically without guessing. What is Sudoku (su doku,sudoko,sodoku)? Sudoku, sometimes spelled Su Doku(sudoko,sodoku), is a placement puzzle, also known as Number Place in the United States. Enter digits from 1 to 9 into the blank spaces. Every row must contain one of each digit. So must every column, as must every 3x3 square. Fill in the grid so that every row, every column, and every 3x3 box contains the digits 1 thru 9. There is no math involved. Nothing has to add up to anything else. You solve the puzzle with logic and reasoning. Fill the grid so that the numbers 1 through 9 appear in each row. Fill the grid so that the numbers 1 through 9 appear in each column. Fill the grid so that the numbers 1 through 9 appear in each 3x3 box. When you fill all the grid right. Congratulate!!! you win the game!!! Printable samurai sudoku puzzles downloads and samurai sudoku game download. Copyright © 2008 Sudoku9981.com All rights reserved.